Last Sunday we went for a short drive to the east of Broome to see if we could find some sunshine! The rain has been great for the land and everywhere is turning green. You do need to be careful of cattle wandering across the highway, as the grass always looks greener on the other side! You must also be careful to not go off the edge of the highway, as you risk getting bogged. The puddles right against the highway had Glossy Ibis on them and they were unconcerned about the traffic-though there really isn’t much in the outback! 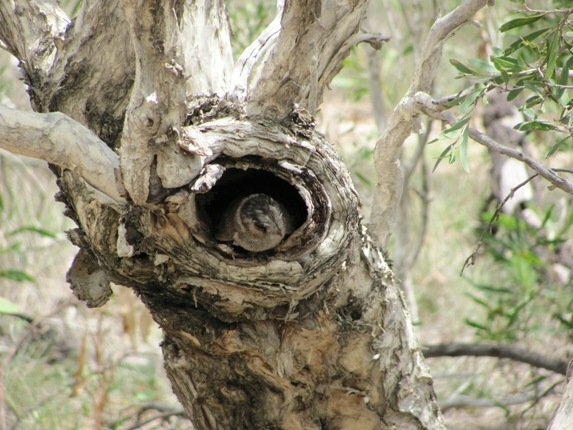 We were driving along slowly when I observed something out of the corner of my eye on the ground and then saw feathers going into a hollow in a Melaleuca tree. We had both seen it go into the hollow and decided to go and investigate from a distance to see what it was. When we looked through our binoculars we could see that whatever it was had turned and was facing us. I had my camera ready as we had no idea what was watching as we approached. Before we knew it the bird had popped it’s sleepy head out to see what was going on. 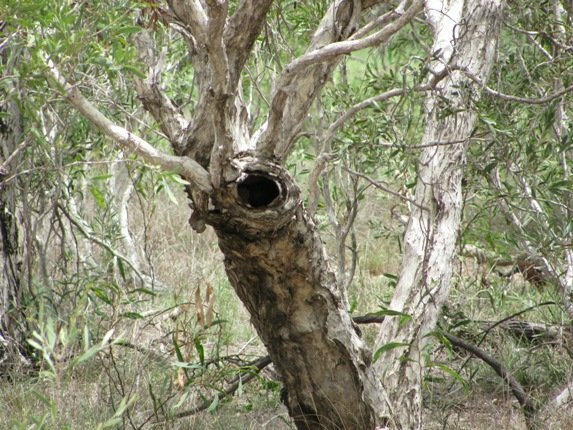 It had quite possibly not come across a human being in this remote part of Australia and these birds are generally only seen at night-if at all. 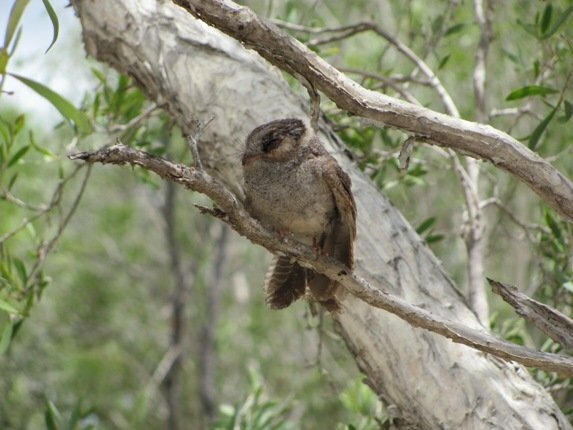 Here we had an Australian Owlet-nightjar! We were fairly distant and watching and taking a few photos and Grant suddenly told me not to move as he didn’t know what was about to happen. 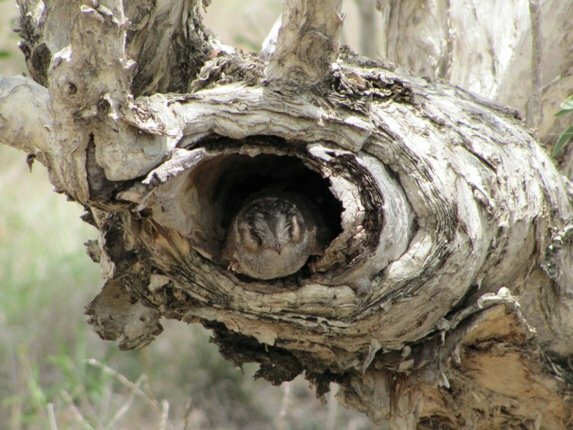 A goanna (small lizard) had also decided that the hollow looked good and was approaching from the back of the hollow. We waited to see what would happen-the bird flew straight at us! It then landed in a tree next to us and I had to refocus the camera fast and take advantage of such an unusual situation. What a treat! Until this day we had only seen them at night chasing insects with the light of the moon and always fleeting glimpses. This was a real treat. 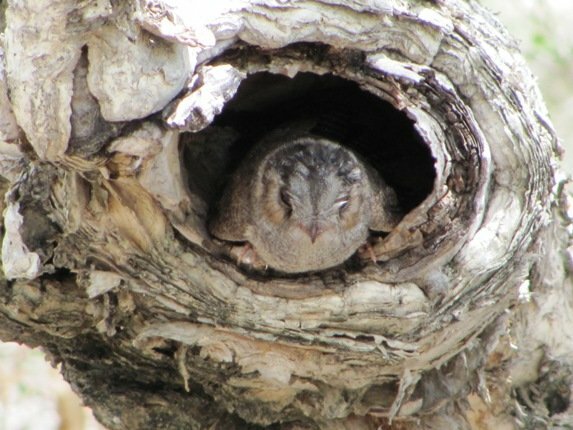 It stayed in the tree for a few minutes and then flew down in amongst the trees to find a new place to relax for the day! Lucky you to have caught this little sleeping Beauty! What wonderful luck. Great pictures. This is Australia, right? Danger, danger, danger is in the cutest creature. @ Jochen-fantastic for sure! 🙂 Didn’t see a snake all day! @Clare: What?!? You sure you didn’t take a wrong turn and ended up in NZ? What a wonderful find! 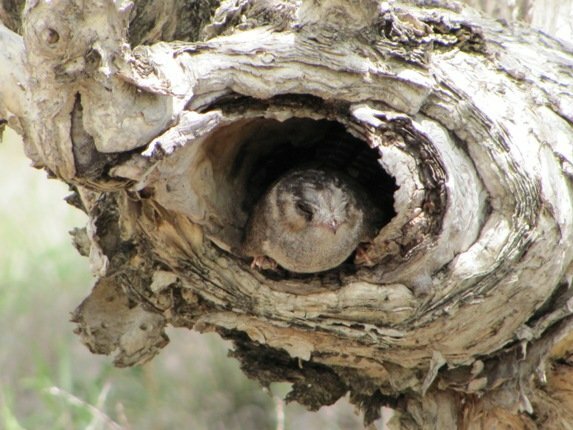 Owlet-Nightjars just might be the cutest birds ever. @ Wendy-looks like you are enjoying cycling and birding like I do, though in quite a different climate! Sanderling seem to have a never-ending supply of energy! Birds sometimes let me get closer on a bike than on foot and with up to 11 metres of tidal movement here we have plenty of beach when the tide goes out! A species that has thus far eluded me. Great spot! @ Duncan-the best birds are the ones you don’t expect, so hopefully one day you will unexpectedly come across one of these! Great post! 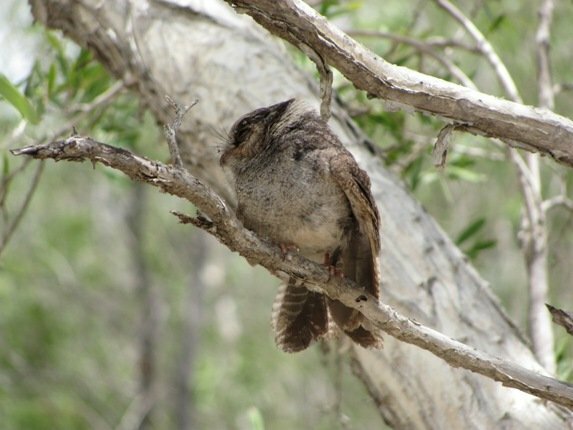 It’s good that you were able to see an Australian Owlet-nightjar. I love your pics too!